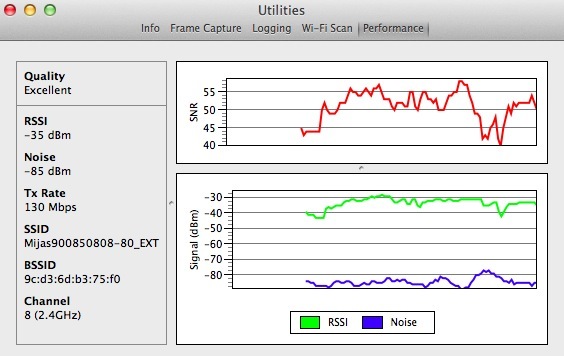 I have a Macbook Pro (model 10,1) running OS X 10.9.3 (13D65) with a wireless problem; it keeps dropping connection. That is, it says it's connected, but if you ping a host...even localhost...the packets aren't returned for a period of time, then it comes up, only to lose connection after a few seconds, then it stays down for awhile before cycling back up again. If you turn off the wireless, it can ping localhost just fine. And a wired Ethernet connection works fine. _handleLinkEvent: Got an error trying to queyer WiFi for power. Resetting state variables. That makes me suspect a hardware issue with the Airport card, but I can't seem to find documentation about that error anywhere. Does anyone know what would cause this or if there's another cause beyond hardware failure? 6/18/14 01:48:16.000 kernel: AirPort: Link Down on en0. Reason 8 (Disassociated because station leaving). 6/18/14 01:48:16.579 airportd: _handleLinkEvent: WiFi is not powered. Resetting state variables. So that is a normal message following a drooped connection or closing the lid. Open your console and report the lines before that message to see who is shutting your airport down. Run Airport -I to get more information on the current connection. For debugging and monitoring you can use the build in tool. In the new window that opens select Utilities in the Window tab. Not the answer you're looking for? Browse other questions tagged wifi airport error logs . What does “mds: (Error) Volume: Could not find requested backup type:2 for volume ” signify? What does an icon that looks like a pair of connected chain links next to a wireless network name mean? What does this Wifi trend by iStumbler mean? My laptop (Yosemite) is now 'PPPoE' connected over wifi, what is this and what does it mean? Strange networking issue: good software/hardware troubleshooting tools? What does 'current channel' mean in Yosemite wireless diagnostics? What does it mean if I see “security recommendation” next to a wifi network?